So pretty it’s disgusting. 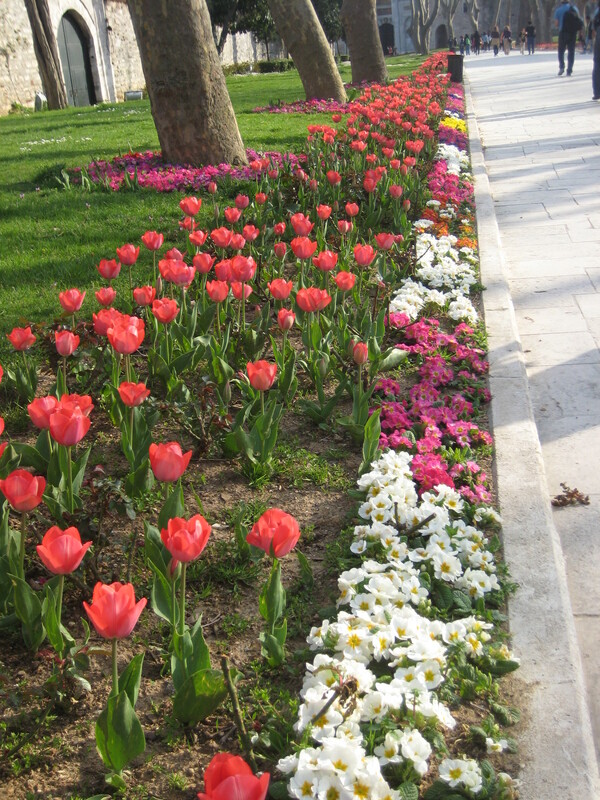 At Gulhane Park. You can do fun things to the word Istanbul, like turn it into Istanbrew, Gristanbul, Istangourd, Grumpstanbul, etc. This is the part of the story where I modify the word Istanbul and describe different aspects of my trip. Istanbloom: I think I finally realized it was spring when I saw all those dang flowers peeping everywhere. I attempted to deal with the tulip madness by taking pictures. In fact, I took many boring flower pictures, all of which my family will be forced to view. Sweetstanbul: Oh sweet tooth, how we tickled and fed and indulged you in this fair city. We sunk our fangs into the chewy but oh so delicious Turkish delight with wild flavors such as kiwi and pomegranate, accented with the most pistachio-y pistachios I had ever tasted. Do I even need to describe the baklava, whose layers were drenched in sin and delicious in every incarnation? Even the angels would have wanted and been denied a bite of my baklava. Nutstanbul: The Turks like their nuts. Daily I thanked Jesus and the lucky stars that I am nut allergy free and was able to stuff my gob with every nutty creation imaginable. If they could, I think the Turks would pave the streets with hazelnuts and pistachios and build their homes with walnuts. Istanhill: Because it was hilly. Duh. Istanbus: I was very impressed with Istanbul’s public transportation, which included busses, ferries, metros, and funiculars, all of which could be paid for easily with the Istanbulkart. Because waxing poetic about public transportation can get boring if not weird, I will quickly move on to my next topic. Just know that the busses had screens in them telling the passengers both the current and the upcoming stops. Okay, moving on. Bluestanbul: The Bosporus and the Golden Horn were so blue! Blue blue blue! While sailing to the Black sea on a Bosporus cruise, I couldn’t stop thinking how jewel-like the water seemed as the light refracted through the waves and pierced into the deep. We could see jellyfish. They are my friends. Istanpuff: The Ottoman sultans loved their puffy clothing. Based on the sheer size of the clothing on display at Topkapi palace, it was clear that the sultans’ bodies, when cocooned in their palace garb, bore only a passing resemblance to a human figure. Everything from their ridiculously huge turbans to their pointed shoes was an exercise in puffiness. 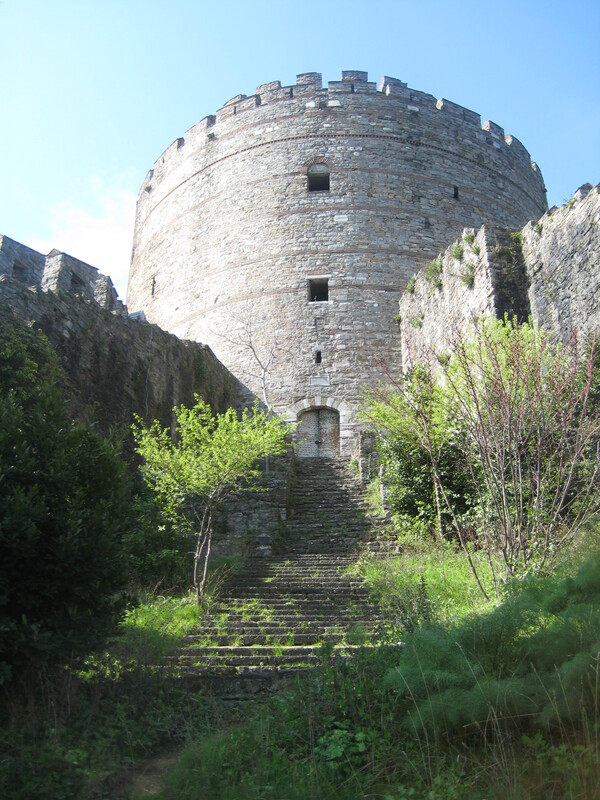 The Fortress of Rumeli is more like a big park. Great for kids and conquering Istanbul. Histanbul: The place was disgustingly full of history. I couldn’t spit without desecrating a famous landmark that was named something ridiculous and looked like it came from a fantasy novel. Around every corner there was a mosque, church, church-mosque, or doner stand that seemed beautiful and worth visiting. Blisstanbul: Because Istanbul restored my faith in cities. It had been so long since I’d enjoyed spending time outside in a metropolis and felt comfortable in my foreign woman skin. When I think of Istanbul I think of colors and peace and happy and days spent watching the waters and the people flow by. And the trees were good too. Ahhhh…. sweet baklava, one of my favorite foreign desserts. I love tasting foreign cuisine, or any cuisine for that matter. I think the Turkish puff fest would be a place where I would fit right in. Not sure about the pointy shoes though. Please, beam me up one of three. Hold on real quick and I’ll send a fax to the queen mother…it might be possible. Let’s call it the floating city of Wordplaystan that overlaps between Istanbul and everywhere else. I thank you—sometimes it’s boring to write true things that are also interesting. I like to mix it up. A valid concern…however, it seems to be the Godfather theme song that perpetually dogs me throughout my time in the Middle East. Great post, thanks for sharing your adventures and your humor! Do Istanbulers eat beets? I wonder…. Number one thing that keeps me awake at night. Baklava – Mmmh! Doners – Yummy! Chicken for supper – Boring! So glad you got a chance to expand your mind – and tummy. Next course please. Nostanbul . . .Because your piece makes me think back (nostalgically) to my visits there. Haha well done. See, isn’t this fun! Thanks a lot—it was a wonderful place, a place people like to live and would like to live. Cleverly told. I enjoyed reading. Glad you enjoyed Istanbul, not Constantinople. I am incredibly turned on by your word play. Call me? Meet me at the nearest Taco Bell. The apple tea was a treat indeed. I’m a big eggplant fan and my tastes were more than satisfied. There’s a dish called “the imam fainted” that was particularly decadent. oooh, informative word play. Innovative. ok, here’s my contribution: Officials have warned tourists not to buy any souvenir jewellery in Turkey, cos Istanbul’s not constant in opals. Ba da bing. Well done. I chuckled.